An embayment in Emeryville, fronts the East Bays' most critical infrastructures that are imperiled by rising waters. By constructing a barrier beach complex and shallowing the currently under-performing basin, a massive expansion of the tidal marsh and its commensurate flood protection capacity is possible. Few global settings can boast the superlative suite that is the San Francisco Bay Area. An ideal natural harbor with numerable protected port sites; the only inland delta on the planet and a multitude of ecological assets; extensive access to diverse regions and myriad natural resources; the home of a deep melting pot of global cultures and an incredibly pleasant climate; and most recently, the global nexus of technologic innovation. It is also a peculiar conurbation in its form: the Bay Area surrounds, and seemingly focuses its collective geographic energy on, its ‘empty’ centrum: the bay itself. This exceptional place will be remade by its rising waters. At over 1,000 linear miles, much of it lined with vulnerable critical infrastructures, the Bayshore—and the intersection of the built and natural environments embodied therein—is primed to experience unprecedented impacts. The ‘hard’ engineering solutions that were historically applied and embraced to control the bay’s dynamics are aging, degrading, economically unsustainable and abjectly failing to deliver multiple social and cultural benefits. Defining where the land ends and water begins, or which swaths are suitable for urbanization and which must be kept, left, or restored for the ‘natural’ landscape, has become a fascinating, multidimensional challenge to ponder in the era of a warming planet. The Bay Area once lay at the heart of the most densely populated region of native peoples in North America. Their essential extirpation echoed and mirrored the devastation of the natural landscape and its resources as European colonialists and white settlers from the East flocked to the bay. The event that drove most of this activity and degradation was, of course, the Gold Rush of the mid-1800s and its commensurate developments. Hydraulic gold mining of the Sierra Nevada foothills flushed a massive pulse of fine sediment downstream, even as dams designed to detain water for booming population centers and agriculture were being planned and built, further disrupting the natural equilibrium of hydraulic and sedimentary cycling in the largest Pacific estuary in the Americas. At the terminus of this watershed, the Bayshore was rapidly filled with trash, rubble and earth to create more area for flatland development. On a map, the Bayshore appears as a line, though it is not: rather, it is a web of overlapping fields that ebb, flow and fluctuate constantly, in rhythms often too subtle for the human eye to see, or the human lifespan to witness. The maximum and minimum reaches of our tides frame the Baylands as a band of ecosystems. As a function of climate change and sea level rise, this band is bound to change dramatically. Therein lies the most daunting and politically fraught reality with which the region’s organizational architecture is attempting, rather gracelessly, to grapple: how can a politically-fragmented region embrace a new paradigm of responsible stewardship and utilization in an age of unpredictable, large-scale impacts of a changing planet? Myriad agencies, jurisdictions, and countless public and private interests vie for some modicum of control over the Bayshore. The net effect of overlapping and competing mandates, outmoded regulatory frameworks and the brittle nature of bay planning, policies and regulations is a predictable petrification of the progressive ethos has defined the San Francisco Bay Area, and indeed, once attempted to ‘Save the Bay’ in the first place. LEAP (the Live Edge Adaptation Project) was conceived as a response to this slow-moving disaster and our shortcomings in addressing it. 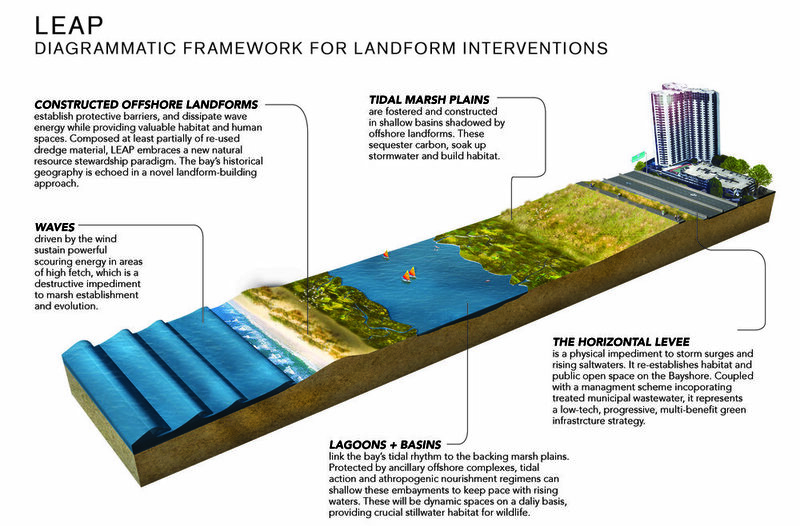 LEAP relies on, envisions and represents a major pivot toward embracing natural shore forms and ecological systems as sea level rise adaptation strategies. By crafting novel resource stewardship paradigms and cutting-edge ‘green’ infrastructure innovations, the Bayshore can be reimagined as a massive expansion and enhancement of habitat and human spaces. Moreover, by cultivating a culture of human beings as ecological architects committed to social and environmental justice, a major opportunity has arisen. The cornerstone of this approach is the tidal marsh. Decimated by hydraulic mining, damming, culverting creeks and the flat-out filling of the bay in the 19th and 20th centuries, the marsh nonetheless represents an incredibly resilient and economically feasible natural complex for reducing surge height and energy, physically retaining water and preventing inland flooding. Marshes also provide major services in stormwater management, carbon sequestration and habitat, in addition to improving the quality of life in adjacent communities. But the tidal marsh, for all of its beneficial potential, is critically threatened. It exists only in a narrow band where the proper elevation, tidal inundation regime and sediment and organic matter cycling coexist. As the bay rises, our surviving marshes will drown without approaches intended to help them keep pace with rising waters. Moreover, the marsh’s natural reaction to a rising bay is to migrate to higher elevations—and thus to the built environment that hugs the shore so tightly in many places. Without proactive environmental engineering measures to restore and build the live edge, and the political will to advance these approaches, our marshes will drown and our mudflats will become open water—the most dangerous condition for any shoreline society to cope with. By embracing novel, naturally-informed shore forms, extant marsh plains can be strengthened and expanded, and new marsh plains can be constructed in the shallow terraces of the bay. Progressive, ecologically-based infrastructure projects must succeed in doing what our traditional approaches do not: delivering multiple-benefit outcomes for the communities and societies that invest in them. By remaking the Bayshore as a vital component of a regional way of life, LEAP imagines a massive enhancement of open space and ecosystem functionality. LEAP is not a coincidental title for this endeavor: one would logically assume the way to gauge progress and to test and identify adaptation and resilience measures in the bay—in physical structures and landscape buffering, in marsh plain nourishment and sustainability strategies and in ecosystem expansion and enhancement—would entail deploying multiple low-impact proofs of concept projects. That logical expectation belies the stagnancy of our regional response to a slow-moving catastrophe. The ironies run deep in the sluggish waters of regulation, protection and traditional restoration circles of the bay. One of the worst, though, is surely the ethical ramification of our generation’s inaction. Political reluctance to challenge outdated and insufficient measures, many aimed at and born of progressive environmental ideals, will doom future generations and the ecologic systems caged by current intransigence. This is an absurdly antithetical fate for a place whose concern for social and environmental justice is undeniable.